Due to increased interest for final paper submissions deadline extension for 18th international scientific conference Business Logistics in Modern Management 2018, we have decided to extend it until June 1, 2018 ! We would like to remind you about our Submission System (http://blmm-conference.com/submission/ ) and guidelines for paper preparation ( http://blmm-conference.com/instructions/ ). Also, please allow us to remind you that our review process is double blind. Therefore, we would like to kindly ask you to upload anonymous final papers (without names). After your upload, the paper is very soon sent for the review through the system so if you need to make some changes, please do it in anonymous mode as well. 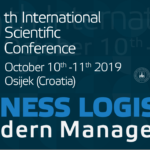 For more information please contact us on logistics@blmm-conference.com We are looking forward to your papers! Final Abstract Submission Deadline Extended until 1st April 2018!